Learn to build a rocket stove? Hand-feed a lamb? Eat clay-oven baked pizzas using ingredients picked nearby? Wassail round an apple orchard? Cheer on the competitors in The Goat Race? Volunteer to help vulnerable kids get a change of scene? Or simply sit, quietly, in a green oasis in the middle of an built-up area and relax? There's lots of fun, interesting and educational opportunities available at community growing projects across the UK aimed at visitors, volunteers and people who want to set up their own groups. Select a region or country from the menu on the left to find about our work in your area and use our interactive maps to bring up profiles of our members. 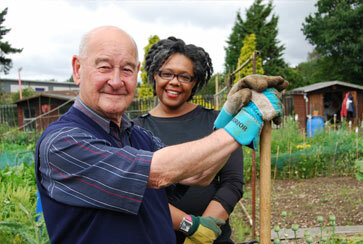 Social Farms and Gardens is pleased to announce its first community managed green spaces awards. The awards are the culmination of the first year of funding from the Welsh Government to the Community Land Advisory Service Cymru. We are delighted to announce that Social Farms & Gardens has been selected to lead the 'Growing Care Farming' Project.